Yesterday was a breath of fresh air to me. Literally! I had both the front and back doors open, for the first time since Fall began to change to Winter. I thumbed through some old albums, tossed aside the Paul Reviere and the Raiders Album, and picked an old Doobie Brothers favorite, and played it on Bill's old stereo. We ate too many ice cream bars. We admired the daffodils, peaking out of the hard, winter soil. We built a bridge over a creek. We collected agates for the driveway. We bounced on the trampoline. Kilchis was having the time of his life, chasing the kids back and fourth to the river. For the first time last night, I witnessed Kilchis, totally exhausted, and cuddled up by the fire. He couldn't move! I didn't think that was possible! There's nothing better than a soggy, lovable dog, to cozy up to, at night. I did some spring cleaning. I vacuumed, dusted, and chased the smell of stale winter out of the house. In between chores, I finished up the web work that I started the day before. You know what I absolutely love about the end of each day? It makes it just that much closer to the next season that I love! Whether it be Fall salmon, or Spring cutthroat, or Winter Steelhead! Right now I'm excited about Spring Chinook! I suppose I should reflect more, and appreciate more the very season that is happening, but I've always been that way. I need to look forward to something, whether it be a vacation, (Oh! That sounds nice! ), a fishing season, or a Holiday. I have been so bogged down at work lately, that I find myself seriously dreaming of going to Disneyland for a week. Disney.com is bookmarked, and heavily used on my computer. Call me silly, but I love Disneyland and Disney World with all my heart. The minute you step on premises, you forget everything adult, and all events are based on happiness, to the point of tears. I do! I cry at Disney! Sup sup sup! There's Mickey! Oh my gosh! Look at the beautiful castle! The opening band ceremony at Disney Land really hurts! Bring the tissues! Yip... Jennie needs a trip to Disney Land. Don't be surprised if one day, I just pick up, and go. It works that way, you know. Grab your Visa and borrow some glee. The boys and I have gone to Disney Land three times, and Disney World once. The trip to Florida was a trip of a lifetime! We haven't been, for a long, long time, and my kids are growing up! Let's see... I'm 43, and I still love to go, so, if the same proves true of my boys, we have plenty of time! Once upon a time, the boys and I picked up cans and bottles off the roadways to earn money to go. We cashed them in and had a savings account called, "Dollars for Disney". It's time to start that up again. Oh... Wake up, Jen... You are dreaming! I was invited to go Spring Chinook Fishing today, but I'm beginning to doubt it will happen. The boy's Dad is to pick them up at noon, and I hate to leave before they are gone. Guess I'll do some book keeping, and enjoy another day of Spring. Perhaps I can set aside a little bit of funding for a Disney trip! It's 4.30 in the morning. What am I doing up? Report back, later. It's my day, you know. Yes, it's my day, and my season, to have to make two hour drives to fulfill my desires! Please read my son David's essay. I had forgotten how beautiful it is, fishing near to Portland on the grand Columbia river! Pete Morris had his boat all launched and ready, when Bill and I drove up at the St. Helens ramp. Pete knows the area well, and named all the sloughs, islands, and explained the history of each. It was fun to search the trees for Osprey, and Bald Eagles. We Kwikfished here, and trolled over there, but nary a springer joined us in the boat. I did have one good takedown on a K 14 beautifully wrapped Kwikie, but that was the only fish interested in our offering. He wasn't interested, long enough, either. It didn't matter, although I would have loved to have barbecued last night. We still had a great time! I came home to hungry kids, antsy dogs who had been inside all day, and 158 e mails! I tried to do as much as I could, but passed out by 8:00 PM. Something about getting up at 4:00, spending the day on the river, and traveling by car that really zonks me! I was exhausted! After a good night's sleep, I'm ready to take on the world again. It's 6 in the morning, and I have an admirable 8 e mails in my box, left waiting for action. That's pretty amazing! I'm happy! What looked ominous and unapproachable last night, seemed easy and effortless this morning! Off to take the kids to school, the dogs out to run, then back inside to update some web activities, off to the doc at 11:00, and... back to life in general! I still find it odd that we, as the United States of America, would send planes over to a country, bomb them, and then send planes that drop sandwiches. If you were going to be bombed, wouldn't you want your sandwich first? I would. The whole thing mystifies me. Tomorrow, it's off to the hospital for an "upper GI scope." I hear it's a breeze, and I hope they figure out how come my stomach hurts. I've lost lots of weight, and that is very nice, but it's a painful way to do it. I've found that I can stop eating without the pain, thank you. It works too! Eat less? Get smaller! Easy! I don't need the painful reminder, thanks. So, I have to swallow a tube that goes into my stomach? Good thing they put you to sleep! I'm going to eat well today. Feast on Girl Scout Cookies and Chinese food for dinner. This, because I can't eat after a certain time tonight. I think it's the perfect excuse. Off to fish for a bit. Kilchis is nearly going nuts these days, as the fishing season around here closes up for the year. I wonder if they serve sandwiches there, before, or after the invasion? Wonder if they take digital pics... I should post them, right? The procedure was a breeze, other than I have a bad headache and feel a little hung over. Andrew remembers the great feeling of being put to sleep and asked me if I could bring some of that stuff home in a doggy bag. Now, that scares me!!! Off I go... It's a rainy, soggy day. I'm going to put my boots on and go slosh on the river bank with Kilchis. Welcome to ifish, Clancy Holt! Yes, he's that famous Washington guide that you see, catching way too many fish, with his clients! He's pretty famous! I feel honored! Plus, he wants to take me fishing with Gary Loomis! I just love Gary! Yesterday was fantastic! I have changed my opinion! The "procedure" I had, was really a breeze, and then... then... It was afterwards that blew me away! It was pouring down rain, but Kilchis really needed to go out. I have a coat, that hangs beside the back door. It's pockets bulk out with the bare essentials I need to go fishing. I simply walk out the garage door, pick up the latest box of shrimp I have gotten from Tillamook Bait, (Which, in this case, was premium fresh!) and try to fit that, too, in my pocket. Kilchis and Dee Dee furiously try to get ahead of me, making it difficult to walk! I hadn't hooked a thing in this hole this year, whereas, in the past, it was the fish producer. I was there, mostly to run the dogs, as usual. Pretty soon, Bill joined me. We cast out, we laughed, we watched the dogs play. Right in front of the big rock, I felt something. I used to cast out to that rock consistently, but this year there is a snag there. I have to be careful this year, and cast exact and carefully, approximately 8 inches from my "go to" spot, to avoid the tackle grabber. "Bill? I think there is a fish there!" I threw all caution to the wind, and a half battered shrimp and pink pearl corky all the way to the rock. It hung up on the snag for a slight moment, and then released... and then DOWN! "FISH ON, BILL!" I couldn't believe it! After hooking several amazing, beautiful steelhead, it never ceases to amaze me the amazement I feel when I hook into another! The 1000th is still as good as the first! I played, and landed the beautiful wild hen that you see pictured above. Bill coached me through a quick photography session, but man it made me nervous! I wanted to have the moment last forever, yet be over as quickly as possible, so I could set the hen free. Afterwards, I stood still, next to Bill, as he continued to cast for it's mate. My rod and reel were propped up, against a tree. I just stood there and grinned for twenty minutes, as the rain poured down on us, and the whole world took on a new color, a new perspective. "You don't know how much I needed this, Bill. I'm going to be happy now, for at least two days! Maybe more!" Bill laughed, as he began to collect his things, and head for the house. I followed him to the house, as the dogs danced around our feet, and shook sheets of water off of their fur. I wonder how long this will last... this satisfaction, this glory? What if I go again today and catch another? Just how much happiness can one girl feel? Is it cumulative or is there a need to feed it to make it last? I guess I'll just have to keep fishing to find out. My coat is dried out, and hanging by the door. I still have my pajamas on, but I could just pull on my waders over the top, and no one would know! To heck with that "fishing for peace nonsense" that I wrote about the other day! I've got a whole new outlook! I'm fishing to feed the need! I lived on 12th Avenue, in Seaside Oregon when I began my career as a CNN addict. I was there, in a warm little house, after spending the day with my then, very small children, on the 12th avenue bridge, fishing, when Desert Storm broke out. Peter Arnett, Bernard Shaw and John Holliman, (Soon to be known as Boys of Baghdad) were reporting from the ninth floor of the Al-Rashid Hotel in the middle of Baghdad when it began. I'll never forget the fear in their voices. I felt it, along with them, and can't seem to shake that memory. I've always had a sort of "crush" on Peter Arnett, ever since. I can't explain why. I just do. It's sort of the same way I feel about Tom Brokaw. They have taught me things, enriched my life with knowledge, opened my eyes to things I didn't really want to know, altered my innocence, but at the same time, made me wholly appreciate my very simple life. "The most frightening moment was during the first hour of the bombing when the very high-powered American explosives destroyed office towers just a few blocks away from our hotel. The impact of the explosion and the heat swept through the open windows of our hotel room. Incidents like this prompted Bernard Shaw to comment on the air: "It feels like the center of hell." It was nerve-wracking to remain in the room but what motivated us to continue was the opportunity to talk to a worldwide audience about what we could see. I remember watching, riveted to my couch, unable to be Mother, wife, or friend to anyone that called, or visited. I was transfixed, horrified, mesmerized by the TV screen. I'll never forget. I stayed up all night, some nights, watching, without sleep. I don't want to go back there, but I feel that same old TV addiction coming back to me. I have to fight it. I want to know how my friends feel about this. Strangers who e mail me about registration questions, or name changes on the board are sometimes, out of the blue, asked, "So, what do you think about what is going on in the world?" The answers are usually strong, but varied. 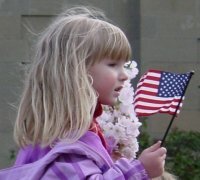 I sometimes feel patriotic, that this is what we NEED to do, or that the people in power know more than I do. Is the reason President Bush seems so cocky and arrogant on television, because I just don't understand it all? I feel guilty because I can't relate to the President's view that "there is no other way, but war." Then I switch to feeling confused, hearing Colin Powell, who I very much respect, echoing that same sentiment. I have to wonder... Am I really wrong to want peace? To expect peace? I have to admit, I am afraid for my country, my family, my world. Is it fear that drives me to want peace? Is it ignorant of me to think peace is possible without war? I'm not a so called "peace activist", but I'm not a war activist either. What am I? I hate that I can't have a solid viewpoint on this!!! So many jumbled feelings, left from listening to the hundreds of personalities in the media. What is my view? I don't know!!! I wish that Peter Arnett would call me and tell me how to feel. "Tom Brokaw? You home? How do I feel?" I switch the channel for a different opinion. Why did the President, the other night on broadcast television, seem to dodge all the questions asked, about peace? Or was it my imagination? I certainly think that Saddam Hussein is an evil man. At least, that is what has been portrayed to me on National TV. I also think that people under his rule have such different life experiences, that I feel it is difficult to judge them, and why they do or feel the way they do. Oh brother. Here it comes again. I can feel it. The draw to cnn, either on TV, or on the internet. Right now, I hear the river running strong, outside of my open window. I live in a place where the mountains protect me, with strong, solid rock walls, softened by tall lush trees that are moved only by the wind. There is no one near me and my dogs, except the scattering of raccoons as I open the door, or the presence of a deer crossing the river, as I approach the bank. On that terrible, fateful day, September 11th, I found myself, again, riveted to the TV. It lasted for only so long, before I forced myself to grab my rod and reel and head out for the river. I just couldn't watch any more! The day was sunny, and warm, and oddly still. I felt disconnected, alone, but thankfully so. I couldn't say I felt peaceful. I didn't. I felt scared, shaken, my innocence attacked once again, but the river was a bandaid for my feelings. Comfort. I experienced a bit of comfort that day on the river, while the world experienced tragedy. Yesterday, while driving home, I had the sudden urge to pull my truck over to pray. I had never felt this sensation so strongly, and for a specific purpose, before. I had been thinking of the Vietnam war, and the thousands of men who have lost their lives.. My thoughts turned to the thousands of troops, (Troops are people, like you and me!) Children, husbands, wives, and loved ones, who are now far from home, awaiting a battle that we are not sure is the right thing! I felt so strongly, that God had asked me to comfort someone, who was far from their home. Some soul that was feeling unsure, or afraid. It felt like such a far reach, that I could help, but...I felt the need to try. I pulled my truck over in a place that was shaded with trees, and overlooked the Kilchis river, and I prayed. I prayed with all my might that whoever needed my prayers would feel me caring for them. I prayed for peace, not only for the world, but for one soldier, or many, who need to know that I wish God's peace to be with them. It was like talking to a friend, although I had no idea who was hearing, or benefiting from my prayer, or if they indeed did feel anything, at all. I prayed that they could feel the same peace, and the ease of escape that I feel, when I so simply turn off the power of reality on the TV, and walk down to the river. When I was done, a single helpless tear fell down my cheek, and I continued my drive home. I was greeted by waggly tailed dogs, good smells in the kitchen, and a warm fireplace. God help me to never again take these simple pleasures for granted. Please help us return our loved ones home, so that they too, can turn off the horrible drone... and return television, to our regularly scheduled program. Congratulations to member number 1088, Talons, for winning the FIRST SPRINGER AWARD at ifish! Way to go, Talons, you will receive a beautiful custom TH Rod! Please e mail him today! Welcome to Bait of Eggs, on ifish! He is teaching people how to build custom rods, and selling rod kits at great prices. See his web page, at Trask River Tackle! I wanted to take a minute to tell you about one of my new favorite products! I have had a heck of a time organizing our mud room. I have to constantly change boots with the seasons. You know, felts in the late spring, summer, and early fall, and no felts in the winter, especially in the snow. So, I'm constantly changing what's hanging on the hangers, and what sorts of boots belong at the ready. No more changes of boots for this girl! Now I have Korkers Konvertables! They are amazing! How come no one thought of this before? They have 5 interchangeable soles. I only have two right now, but I've got more on order! I keep the extra soles in my tackle drawer, and whenever I think I'll need boots for more than one occasion, I can slip the soles I think I'll need, in my tackle bag and take them along! I can change for the conditions needed, immediately! Now, with Korkers, I have the boots that I'll need, in one place, year around! You can take a peek at them, at www.korkers.com, or on on My Favorite Product page! The NW Steelheaders are having a swap meet! Make sure to mark your calendars! I am busy with the purchase of the new dedicated server. Man, is my credit card getting a work out! It makes me so nervous that I'm afraid I'm going to have to go fishing now. I braced myself as I saw the wind gusts coming up river. I could see it coming 1/4 of a mile downstream. The river surface became ruffled and frothy white, as it raced towards me. I dug my heels into the rocks, and tipped my hat so that it would not fly off of my head. Just as a gust passed, I attempted to sidestep my normal two steps to cast a little further upstream. I was working the water as my Father had taught me, three decades ago. This time, however, my foot caught on a rock, I over corrected, a gust hit me, picked me up, and I was suspended in air, sideways, for a moment. Then I came down hard on my thigh, with a body jarring, tooth jamming crash. On my way down, I tried to hold my rod high, but nonetheless, the tip hit the ground with a slap. It worried me, but more, I was concerned with my thigh. I whimpered a bit. Kilchis came to check me out, (laughing, I might add), and I got up. I'd had it. It wasn't a nice day to fish, despite the deep green of the water. It had called me from the bedroom window, that morning. The color and height reeked of steelhead. I think 30 mph winds and driving rain is pretty much my limit, though. I limped pitifully to the garage, hung my rod up, and walked indoors. "I fell down." I whimpered to Bill. "What? Is your rod OK?" He jumped out of his chair. "I think so, Bill, but my leg...."
Bill was gone, rushing to the garage, mumbling something about bruises and fractures. He came back in, with a dry cloth, gently swabbing the tip of my rod, eyeing it carefully. "Where did you hit it?" He asked, scrunching up his nose, and trying to make his bifocals work for him. He was concentrating on the eyes, and searching for any bruises on the surface of the rod. "Right here!" I pointed, gently rubbing the swollen bump on my leg. He ignored me and turned the overhead light on the real source of attention... and it wasn't me. He fiddled with the reel, searched the length of the rod for any source of damage. "You might have hit it here..." He pointed to the top ferrule. "No! I hit it here!" I pointed to my thigh. "No, right here, by the first eye, there is a blemish." "Not by my eye, Bill, my LEGGGGG!" It was no use. You can certainly tell what is important in our household. He finally chuckled and explained to me, that while I heal, the rod cannot. "Oh! Poor rod!" I finally gave up and invited Kilchis into my lap for a little pity party. I gave into the fact that we live on a river. We fish. We fall down. We get hooks set into our hands. We suffer cuts on our hands from fish teeth. But we get up and do it again. We heal. I gathered my wits about me, and got up from the couch. I grabbed the rod from his grasp, opened the door to the outside, and headed back down to the river. Ever get tired from casting all day? Wish you could learn to be ambicasterous? Learn how to cast with your left hand, with Stan Fagerstrom's column, by clicking here. Spring brings Andrew and I upon the time of year where we get our echocardiograms done, and it always makes me a bit tense. It's the "doctor time of year", when we get Andrew's eyes checked, and both of our aortic aneurysms checked for growth. Time to find out whether or not we might be facing heart surgery any time soon. I thoroughly enjoy the 11 months out of the year when I don't have to worry about it. Of course, I have to realize that the "echoes" are better than the "endos". I mean, we DO want to know! It's such a sigh of relief to hear the cardiologist say that we are still holding at our last years size, or perhaps went up only a few centimeters. Things can happen so quickly, and I just hope that both of us are still holding out... so to speak! My test results from last week's GI scope shows that I have a rather large ulcer. You know, it's almost a relief to have something "normal" go wrong. Still, it's yet another uncomfortable medical problem, and I just kind of tack it on to the list of little hassles in life. They gave me some strong medicine, and I'll go learn the results of the biopsies they took, later today. Andrew and I have fun teasing each other... The other night he couldn't see something, and I said, "What? Are you blind?" We both laughed. Andrew's aunt asked him about his art skills, and said, "Aren't alot of Marfan people artistically gifted?" Andrew replied, "Yeah, it's a disabled thing. I'm special." Disabled humor. I love it. Enough medical reports... Let's talk about ifish. I decided against the purchase of a true dedicated server, and opted, instead for a new technology, which is less expensive, called "virtual private servers". They partition servers off, so that they are capable of an allotted portion of the entire servers capacity. I think we'll be happy with it. Our continued growth is not a problem, as they can seamlessly upgrade ifish to a higher level of service without interruption to our connections. I signed on the dotted line yesterday, and we should be moving ifish today. I'll play with the files on the new IP address, and beat ifish up a bit for a couple days before we go live with the DNS change sometime early next week. We'll try to make it happen during the night time, to lessen any withdrawal pains that the bulletin board people may experience. I'm considering purchasing a new stats program for ifish called URCHIN. It's extremely robust, and would serve the ifish purpose well. The Kilchis river was high and the most brown I have ever seen it, when I got up this morning. Deep chocolate mud poured down the canyon. There must have been a small slide upstream. Two hours later the river had returned to a beautiful deep green color. Way to much water to fish, but inviting, none the less! The slide will provide a good run of agates, and I can't wait for the water to recede for two reasons now! Steelhead, and agates-- my two passions on the riverbank. The barometer fell drastically last night, and I could feel it in my bones. Birds are feeding ravenously this morning. When I went out to my truck to take the kids to school, the trees were alive with their songs. Signs of spring are welcome to me, this year. There may be a strong storm coming in, tonight, and I feel myself excited and a bit worried all at the same time. Storms do that to me. I worry about my little hummingbirds, the possibility of a flood, and downed trees. But somehow, the intense power of nature thrills me, and I watch the clock and check weather reports in mixed anticipation. CNN blares occasionally, on our TV, until we get tired of hearing the press reports. We try to debate our feelings about the state of the world at dinner time, but finally realize that without facts, we cannot come to a conclusion, nor a peaceful resolution. I sincerely feel that we do not get an honest report from the press, so why listen? Why debate? Why argue? Better to just walk out to the river. I listen to the powerful sound of rocks churning under the weight of the water, and stand in awe as nature prepares to stir things up, once again. I somehow feel a parallel between predictions of weather, and predictions of war. I find myself leaning towards the thoughts of summer, and somehow hoping that the weather, the season, could possibly carry along with it, peace to our world. March is certainly blowing in like a lion. Hope it blows out like a lamb, and brings thoughts of peace, along with it. Poor, poor, Kilchi-mancini-man-cuteso... (This is the latest evolved name for our beloved mutt dog, Kilchis.) Andrew calls him "Tripod" now. I don't know what the problem is, but two weeks ago, he began holding his right paw up high. He was happy, wiggly, but in pain. He ran, like he always did, except on three legs, instead of four. Gradually, it went away. Three days ago, it began again. I thought it was back, but Bill said, "That's the other leg!" So, now it's his left leg held up high! Yesterday, in the usual routine, I got up from bed to go downstairs. Usually, I have two dogs wiggling at my feet. Kilchis was absent. I heard him whine on the bed. When I went back upstairs, there he was, sitting high and proud, shaking with happiness, but holding his left leg up, to tell me he couldn't get off of the bed! I helped him down, and made an appointment at the vet. This had gone on long enough. This time he was in real pain, and really couldn't move much. When I got there, the girls in the clinic were discussing a beagle that needed a home. One girl went on, "This dog needs a home where it can crawl on the furniture. I just can't keep him. My dogs are well trained!" I chimed in that my dog is well trained. All I do is say, "Kilchis! Time for bed! And he jumps right up on the bed without any further command!" "Furthermore," I continued, "He'll do the same on the couch, without my even asking!" The gal was not impressed. Some people cannot seem to understand the behavior of a well trained member of the household. Anyway, the vet was concerned about Kilchis. He quoted several diseases with long names, OCD, calcium distribution problems, and a couple others, but he would have to do an X ray to know for sure. We decided that Kilchis would do best by taking anti inflammatory drugs for a week to see if he gets any better. If not, under anesthesia he goes, and off to the X ray room. He's to not over exert himself. That will be tough! Yesterday, I fished for a while out back, but had a tough time watching Kilchis race after dippers, when the doc said not to. So, Bill and I jumped in the truck, locked Kilchis in the house, and made it an excuse to go fishing upriver. It was SO beautiful! We found some absolutely gorgeous spots to fish, while Kilchis rested on the couch. When I went to visit my surgeon on Thursday, he said I have a very "impressive" ulcer. I told the doctor, "Thank you!" He was concerned, and not humored. The ulcer is very large and deep, nearly through the lining of my stomach, and is concerned that with Marfan syndrome, it could perforate. Yikes! I walk carefully now. He gave me a whole bag full of different medicines, and wants me to have another GI scope in 6 weeks. Looks like we are both under the weather. We are both, not to over exert. "Kilchis? Time for bed!" We are going to work on this exercise until we both feel better. I bet that I can train him to even get under the covers with me! You just wait! He's really smart and well behaved! I woke up last night from a terrible, frightening dream. I dreamt that France had sold Iraq a nuclear bomb, under the agreement that should the UN ever decide to take action against Iraq, that France wouldn't go along with the UN. The agreement was that France would go along with them, or else Iraq would use these weapons against France and the rest of the world. I woke up so abruptly after that dream that I sat, bolt upright, shaking. In my dream, right before I woke, the news that was playing in the background changed to an emergency alert test pattern. It wasn't real, but it felt so real! The scary part, is that it could be true. I don't know that it's true, but what do we know? I finally got back to sleep, but the day still feels affected. I hate that, when you dream that your friends do something, or your "sig o", and you spend the day being upset over what happened in a dream. It's not fair! It was a dream! When I finally got up, the sun had yet to rise, and the full moon was covered by a thick haze of fog. I went to the window, and turned on the spotlight, looking for elk or deer. The meadow was eerie still, quiet, and vacated. The river was hushed, as a covering of fog can do. Still, as I gazed out the window, a feeling set in, that the whole world was too calm. Give me some wind, some movement, some animals grazing! Finally, a bird lights on the feeder, and helps stave off that feeling of emptiness. But the sky is fogged over, and dark, with a yellow tint, that sometimes happens before a thunderstorm. It's eerie! Yip, I'm a little shaken. A little worried. A little preoccupied with the world and all that could be, and all that we don't know. I think I'll go fishing in my pajamas. I just don't want to take the time to shower, get ready... I'll just pull my waders over the top, and go. In the back of my head, I hear a song that my Mother loved, when she was battling with the cancer that took her life. It's a little corny, but I still hear it, and somehow, it comforts me, too. God will take care of you. The rest of the song, is here. ...and God, please bless our troops, our families, and your world. Geez Louise... We have a new server through SiteTurn.com and it was supposed to be as zippy as my last. Not! I started doing maintenance on the board this morning at 5:00 AM, to miss the high traffic time. It usually takes me 38 minutes to go through all of the indexing, search, member files, etc. Well, it's been 2 hours and 54 minutes now, and it isn't even done with the search indexing! Either something is terribly wrong with the board, or something is terribly sluggish on the server. Oh well... These are the days of my life. I woke Andrew up this morning, and said, "Welcome to war day!" He said, "Thanks Mom, that's cheery. Well? What do you do? This morning on the radio talk show I was listening to, they played a beautiful rendition of "God Bless America." I support our troops, yes. I feel like we need to stand United. I don't feel this is the time to undermine our leaders. God Bless America... and if you aren't too busy, God, could you please speed up my server? Wow! After maintenance yesterday, the server seems to be getting well! I don't know what happened, but the lapse time in posting is getting less and less! Perhaps the server people tweaked it to handle UBB better, or perhaps... magic occurred! But it's digesting data much zippier now! YAY! Maybe I can stay with this host? I could stay up all night and watch CNN. I can't stop, yet I don't want to see it. I finally forced myself to watch regular TV at 9:00 so that sleep would overcome me. I didn't care what it was, just something... something without missiles, please. I woke up at 4:00 this morning to the sound of howling wind and driving rain. I turned on the TV and walked out of the room. I'm not ready to see what happened yet. Andrew is totally against war. David says that he tries to think of other things. David studies his homework and watches movies, instead. He watches the channels that are sure not to break in with news alerts. Andrew plays music too loud, and practices his bass guitar. I want to go fishing, but the weather is so nasty out. I bet that the river is blown out, anyway. I'm going to sit back, beat up the server a little more, testing it, seeing how it reacts to different commands. I feel a little more calm about it's abilities. Perhaps now I'll grab my coffee and go see what is happening on the missile channels. Hope you have a good day. Hope you have a peaceful day. Hope you... I can't figure out what to end this with... Have a great war day? Have a little bombing with your breakfast? Imagine our bickering world leaders all in a hog line together! Let's all just go fishing! Put down your guns, now, and let's get after them! Pick up a rod, climb in the boat, and go after a springer! All the political people wiggling Kwickies! The world is saved by Luhr Jensen! If we saw them all on the river... We'd know that it was going to all be alright again. Jennie's fishing life? Not nearly enough, lately. I did land two nice steelhead yesterday, right out back. They were beautiful, both around 9 to 10 pounds, on the old faithful pink pearl corky and shrimp. This morning, around 7, I paced around the Laundromat, as Andrew's size 17 tennis shoes banged against the dryer drum. Size 17 shoes aren't easy to come by. He only has two pair! They danced around dangerously in the dryer, and the door kept flying open. I finally grabbed an old magazine and leaned against the door so that it would stay shut. We were going to be late for school, and the dryer had 11:00 minutes of quarters to go. Andrew sat in the car, barefoot, news radio blaring. He had fallen in the river the day before, and he had forgotten to dry them. At 10 before "time to go!" he decided to enlighten me about his predicament. He didn't want to wear his Birkenstock sandals. He looked at me incredulously when I suggested it. "What? You want me to look like Jesus?" The article I chose to read was an old issue, around the time of Mother's Day. It was written about being thankful after you had grown up, for all that Mothers do. "Thank you for serving lunch in the fort." "Thank you for not buying me everything I wanted." "Thank you for waiting up for me at night, even though I acted like it bothered me." I chuckled. I could relate to some of these. Not all, yet, but I'm sure I'll be there soon. There was an odd looking old woman in the Laundromat at that early hour, pacing the cold, hard floor, slowly and methodically. She had been there before. She knew this place. I didn't.. Her disheveled clothing hung from her body, as if it had been laundered too many times, or perhaps-- not at all. Everything hung from her body. Her face showed years of kindness. The skin of her face had fallen from youth, and sagged loosely around her neck. Her skirt was hiked up in back to reveal what I would call, her "shorts", but they were, indeed her underwear. Underwear that also, hung from her body. The whole scene was bizarre. As she paced, she ranted the same words, over and over. "I hate Bush! I like Saddam! I wish that all of our ships in the ocean would sink! I hate Bush! I like Saddam! I wish all of our ships in the ocean would sink! Ships in the ocean would sink! Ships in the ocean would sink! This went on for the full 30 minutes of dry time. She didn't look at me. She didn't look up much, at all. She was off in another world, and the beat of the tennis shoes, rather oddly matched the rhythm of her chant. Finally the dryer was finished. I tried to get a glimpse, closer, of the woman's face, but she was lost in another world. I drove Andrew to school, and came home. I flipped on CNN. I witnessed the horrible bombing in Iraq. I never want to see that again, and I could have easily lived without it. I cried. I was shocked, afraid, and my ulcer took on new dimensions in pain. This has been a surreal day. I don't want to watch any more TV. I don't want to go back to that Laundromat. I want to go fishing but the weather is raging, the rivers are flooding, and the sky is wild with wind and rain. I went to the store and bought Kilchis an indoor squeaky frog toy. I bought the cat special cat food. I bought cleaning supplies, thinking I'd want to clean when I got home. I don't. I called Kilchis and gave him his frog. We played together, and laughed. He still wants to go outside. He is a nutcase. When little else can make me laugh, Kilchis can! Although Kilchis is feeling penned up, and wants free, I'm happy inside, today. I think I'll make a pot of tea, and go upstairs and read. Kilchis will curl up by my side, and.... then start gnawing on my fingers until I play with him. Cuddly, he is not.... very often, anyhow! I'll watch the river rise, and the trees bend over sideways, and later, cook something good for my family. ...and I keep thinking that someday, Andrew will remember me for the little things that the magazine article had noted. This weather will clear up, you know. Soon, it will be gardening, and barbecues, and spring chinook! I took the weekend off! Then, afterwards, I had fun messing with the hanging pots on the deck. I filled them with new potting soil in anticipation of spring planting. I walked the river bank, still too high to fish, but perfect for agate hunting. My driveway down to the river bank is getting full of agates! It's a new tradition in our family, that if you go down to the river, you simply must add an agate to the driveway. Pretty soon, it will be covered in white crystal! In the midst of the war, I'd say it is high time to leave the media at home, and go springer fishing! It is the perfect day, today! ..and so, with that said, I'm putting my boxes together, grabbing my favorite Lamiglas MB80, and heading out. Bill and I are meeting Pete Morris on the lower Columbia. Hope the water is in shape, because we are heading out! Look out, Salmonids, and look out BBQ!!!! I've always maintained that Fall is my 'ever so favorite' time of year. But I find myself challenging that, throughout the seasons. I just hung up my rod after landing a beautiful big steelhead. My fingertips are frozen. The world smells fresh after the rain, and the meadow is the most beautiful shade of green that you've ever seen. It's spring! Huge heavy downpours of cold rain, followed by bright bursts of sunshine. It's cold and nasty out!! No! It's warm and sunny!! It's time to plant the flower beds! No it's not! It's raining again! Every year we buy a huge bag of daffodil bulbs, and they are currently scattered about the meadow in different stages of bloom. It is so exciting to wake up and find another patch of green, freshly painted bright yellow! It's breath taking, at times. I can fish for Spring Chinook. 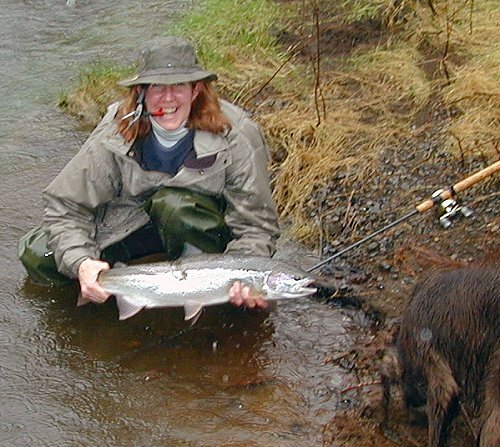 I can fish for native steelhead. We can take a break and go to a lake to fish for trout. Giggle fishing, I call it, and it proves true, every time. I love it! I can use my fly rod for steelies, my smaller fly rod for trout on the lakes. I can grab my backtrolling rod and climb in the boat for a day on the Columbia. I can still use my favorite steelhead rod and reel. I can fish for sturgeon, rock fish! I can go crabbing! I can go clamming! Or sometimes, on a cold and rainy spring day, I can still curl up, and make fresh bread and clam chowder. When I am home, I notice the days getting brighter a little earlier and the evenings growing longer every night. I love the darkness of winter, but the challenge of getting everything done that I want to do in daylight is a struggle. Now I have time in the evening to fish after dinner, and time in the morning to fish before breakfast! Kilchis is delighted with the extra exercise, and I am starting to feel the stretch in my winter's lazy muscles, and it feels good! Although I love winter's warm comfort food, I'm starting to crave barbecues of fresh springer, and salads of fresh greens and strawberries! Yes, I love Fall, with it's gorgeous splashes of golden yellows and deep reds. I love the crisp in the air, after stagnant and long, warm, summer evenings. I love the arrival of our winter birds. But most of all, I love the anticipation of those huge fall chinook! It's spring here, and we had our first purple finch show up yesterday, and our first bandtail pigeon show up the day before. Our hummingbirds are growing in number, our junco are still mingling here and there, and the chickadee are still blending in the mix. It's spring, and I've decided, just for today, that spring is my favorite time of year! I ask permission to change my mind about that, at just about any time of year. Busy day for ifish-- I'll tell you all about that, tomorrow, but between random casting breaks down at the river, I'll be stuck to the keyboard. Please take note of Stan Fagerstrom's new column, here. As much as I have tried, I haven't yet successfully hooked a steelie on plastic baits. Perhaps with this advice, I'll do that, today! I'm sure going to try it! Won't you? I had an absolute blast yesterday! I don't need a boat anymore! I am my own boat! I floated around in the Kilchis yesterday with my own dry suit, made by USIA. USIA (click on the word to access their internet page) is the company you've probably seen on the news lately. They produce many items for our troops, over in Iraq. They make waterproof bags, and other miscellaneous items. 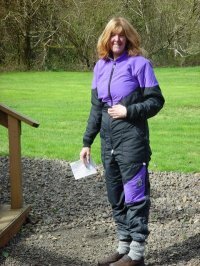 They created custom waders for me, a dry suit, and warm, wonderful insulated clothing to keep me warm, underneath! Kim John's statement to me, was "Jennie, you will be safe, and you will never be cold, again!" I believe it to be true! I am sitting here, right now, wearing their Exotherm 1, snug as can be, without the heat on! Pictured here, is the Exotherm ll undergarment for really cold days! Kim Johns, from USIA, came over yesterday to teach me a little about cold water survival. I think it is all a conspiracy to get me to go out in the ocean, something I have long been not so fond of! I'll have to admit, after floating in my dry suit, my confidence is rising! I mean, hey! If I don't like it out there, I can just walk off the boat, and float to the beach! Anyway, if you would like to see more pictures, please click here. For now, at 6:10 in the morning, Kilchis and I are going to go explore the wonders of the pink worm with a corky attached to it. I may add a little of Marie's shrimp scent. Last night, just after dinner, Kilchis and I headed up river to tease the steelies. I carried with me, 3 rods: My fly rod, my jig rod, and my casting rod. The river has dropped SO much! So, I leaned that rod against a tree, and headed up river with the remaining two rods. I cast flies for a while, and although I thoroughly enjoyed it, I did not get the magical steelhead of my dreams. I was using a fly that Shane Stewart gave me. I honestly believe that that will be the fly that works for me.... SOMEDAY! I set that rod down, and picked one of the barely alive, remaining three shrimp I had, plucked off the tail, and slid it up on my pink and white First Cast Jigs. One cast! I couldn't believe it! I never snag in the trees in the maple tree hole, but I did! Lost the whole darn rig, and not even my "tickle approach" to retrieving it was successful! I finally broke off, and my bobber (my favorite bobber!) plopped down into the river, and floated away. "Go get it, Kilchis! Fetch it up!" Kilchis looked at it, and then looked at me, and with a very unenthusiastic look, said, "Nah," and instead turned to chase a dipper, heading the other way. With a sigh, I picked up my two rods, and headed downstream. I had one rig left. My handy dandy fly rod with my Lamson reel. I gathered my casting reel from the bedroom hole on the way down, kicked rocks, searched for agates and any lures that might have been exposed in the receding waters of recent days. Finally, I was at the lower hole. I set my gear(s) down, and picked up my fly rod. I cast into the riffles that fell into a deep slow pool. As I stood in two feet of water, my fly worked in the current. I glanced down at my feet. While I didn't hook a thing, there, floating in between my two feet, was.... my bobber! It was a simple pleasure, a booby prize of sorts, but it made me smile. I couldn't help but think it a heart warming gift from God. It isn't all about fish, for me, obviously! With the setting of the sun, and a deer crossing the stream ahead of me in the shallows, Kilchis and I slowly headed back to the house. The meadow was quiet, hummingbirds buzzed in the brush around me in a late evening rush. Just give me the river, and a bobber of a booby prize, and I'll be satisfied. Wow! My arms saw the light of day for the first time in months! I was working outside in my tee shirt! It felt so.... soft! Everything was soft, from the new blades of grass, to the warm breeze, to the soil that my hands worked in! We had two soft days! Could you believe the temperatures? Now we will be plunged back into winter! Don't you just love spring? I'm ready, though, for more soft weather! This winter stuff is getting old. Somehow, the sunshine and warmth helped me to deal better with all that is going on, in the world. I'm kind of sad today, as I realize that The Kilchis river closes tomorrow. No more fishing in the Kilchis for two whole months. I have to figure out a reason to go down there with my dog, Kilchis now. I forget what I did last year! I'll have to look it up in my journals! I know there is a reason! What I do remember writing about, is going stir crazy after a while! The first month is OK, the second month just about drives me up a wall! My strawberries are transplanted, a job that I have put off for too long. I have seedlings planted in little fiber pots. My begonias are starting to shoot. My fuschias are starting to get little tiny leaves on them. When I wake in the morning, I am greeted by a whole forest full of singing spring birds. The elk are coming down from the hillsides, and leaving deep gouges in my trails to the river. There are droppings as near as 10 feet from the house. They are so sneaky! I never get to see them, yet the evidence is right there! Today, we are going to float the Wilson, or go over to the Trask... Can't figure out which. We were going to go Spring Chinook fishing, but decided against the long drive. I have to do some late night work on ifish tonight, so I'll be up really late. I have the cutest little purple finch visiting this morning. The first of what hopefully, will be a whole group of purple finch friends! Have a great day... I'm off to shower, and hit the river... for the last time, in a long while.